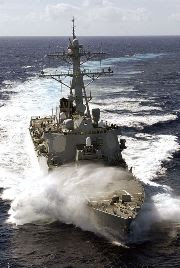 The Captain congratulates RUSSELL’s newest Enlisted Surface Warfare Specialist. The Captain administers the oath of office to a brand new Lieutenant Junior Grade. A member of the boarding team scales a cargo net during a practice boarding. 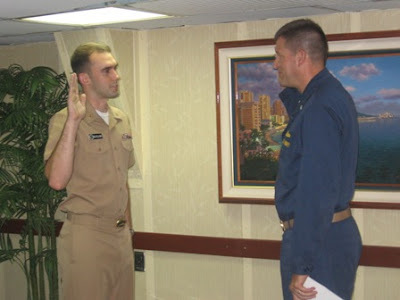 Congratulations on your selection to CDR. Well done and well deserved. Congrats on the promos, everybody. :) The boarding team pic is my favorite.. Top quality, sir! Chris...uh, belay my last....CDR Congrats sir!! That's awesome. I can't tell you how glad I am to see your VBSS Warriors kitted out! If you do a little looking in the archives at Proceedings you can find my thoughts in the APR 02 edition. Sometimes an article can allow you to move a point forward when a point paper does dies on the vine. Funny how effective that works.